Convert WMV to iPhone, TV, game console and any popular optimized preset. 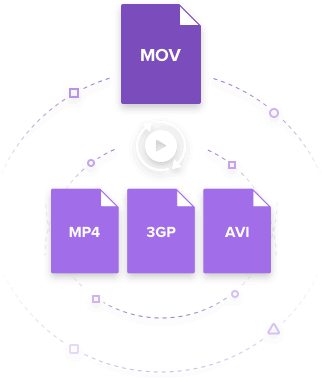 Convert WMV to over 1000 video/audio formats, including M4V, MOV and MP4. As far as we know, WMV file format allows large video files to be compressed while retaining their high quality. WMV videos may be of any size and may be compressed to match any bandwidth (connection speed). Therefore, WMV videos becomes very popular among video lovers. However, WMV video is not compatible with iOS devices like iPhone. So if you have a lot of WMV files and want to play these files on your iPhone, you need to convert WMV to iPhone compatible format first. To import your WMV files into iPhone, this article will recommend a great WMV to iPhone video converter. Just read through the article to get it. Also read here to get more free iPhone video converters. 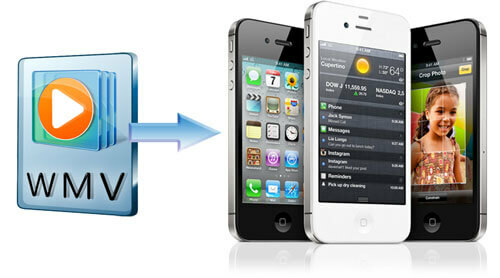 This WMV to iPhone video converter helps you to do the conversion efficiently and seamlessly. 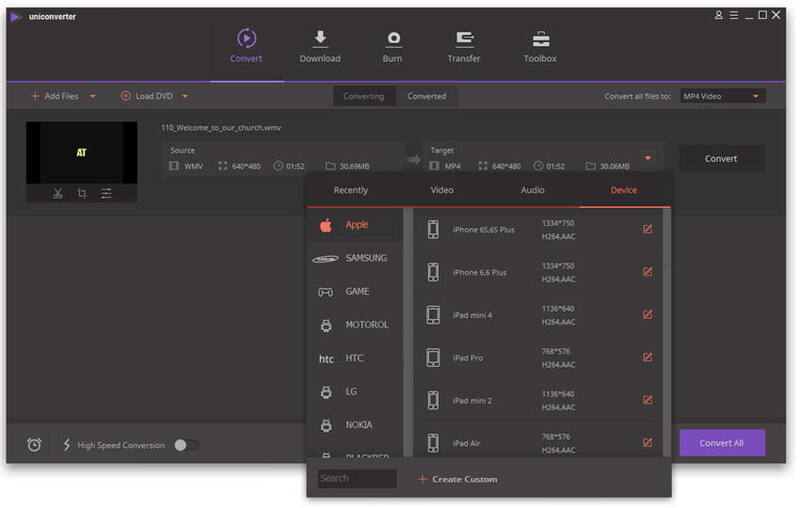 Using this tool, you don't need to remember the suitable video parameters, like bit rate, frame rate, resolution, etc. for your iPhone model because it directly provideds the optimized preset for it. Professional WMV to iPhone Converter: Converter WMV to iPhone compatible fomat, such as MOV, M4V and MP4. Also you can directly set iPhone presets as the output format. Extract Music From Movie: You can use it to extract music from your favorite movies in MP3 or AAC fomat. Then you can enjoy the music on your iPhone. Poweful Video Editing Tool: Just take this iPhone video converter to trim, crop, add effects to your WMV video before conversion. Download Online Videos: This app also lets you download and convert online videos (YouTube, Facebook included) to play on your iPhone. Note: Below I'll show you how to convert WMV files to iPhone on Windows step by step. If you want to convert WMV to iPhone on Mac, you can go to User Guide of Video Converter for Mac (Mojave, High Sierra, Sierra, Mavericks, Mac OS X Snow Leopard, Lion and Mountain Lion included). Click the Add Files button. You can choose to add video files or video folders from your PC, or directly load videos from devices. Click the Target drop-down button to choose Device tab > Apple category and select the specific model of your iPhone. as your output format and define the detailed settings. For iPhone, the converter has an optimized preset for it so that you can select it as your output format directly. 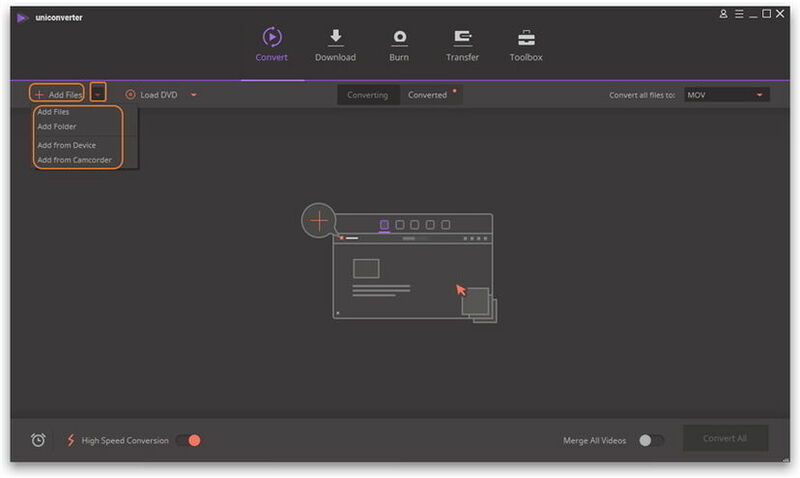 Tip: This Video Converter also provides powerful editing function, which enables you to edit your WMV before the conversion, such as trimming or cropping, adding effect, watermark, etc. Hit the Convert button to start the WMV to iPhone conversion. Once finished, you can switch to Converted tab to open the folder where the output files are saved. So if you're puzzled to get WMV played on your iPhone, just try to download Wondershare UniConverter (originally Wondershare Video Converter Ultimate) to free yourself.